"Great tuition, great cars, the best instructor, had a wicked time"
Gloria Herasme, passed second time, April 2007 at Winchmore Hill. Before you can take your practical driving test you must pass the Theory and Hazard Perception test. The theory test is a computer based, touch screen examination which can be taken at various centres around the country. It is a 57 minute test consisting of 50 multiple choice questions. You will need to answer at least 43 questions correctly to pass the theory test. After a short interval, you will then move on to the hazard perception test. This test will require you to watch 14 video clips containing several hazards for you to identify. The quicker you identify the hazard, by clicking the mouse, the more points you will score. There will be 15 main hazards in the test each worth 5 points. The pass mark for this test is 44 out of a possible 75. You must pass both the theory and hazard perception tests together to gain a theory test certificate. 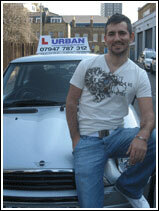 At Urban Driving School we can provide you with theory and hazard perception test training by allowing you to practice on one of our laptop computers during a driving lesson if you so desire. This service will hopefully assist you in your preparation for the actual examination.